A pump controls the system's airflow and creates a vacuum to further expedite transpiration. The moisture is then drawn out of the dome, and condensed to form purified distilled water – which can have salt added to make it suitable for drinking. Drop by Drop also releases oxygen into the room. "The proof of concept is indeed a mini version of the Amazon," said Ghosh, a student of the Royal College of Art's (RCA) masters programme in Innovation Design Engineering. "It is a biosphere wherein the five key factors necessary for efficient transpiration, namely warmth, wind, light, pressure and humidity, are maintained at an optimum level." 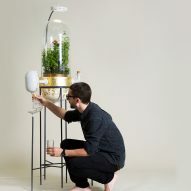 The designer set out to create a proof of concept that would be "beautiful yet provocative", designing something that's intended to be placed in the living area rather than hidden under the kitchen sink. He recommends using herbs as they can be easily grown indoors for use in cooking, and add an enjoyable taste to the filtered water. If the owner's away from home, the pipes can be stoppered to create a self-sustaining atmosphere, as the soil is filled with microbes and insects that provide carbon dioxide for the plants. A watering can that sits alongside the dome is on hand to encourage users to pour in dirty water. "The idea is to change the way we procure and consume water at a larger level," Ghosh told Dezeen. "In order to do that, there needs to be a change in the value system and what better place to start than the home?" 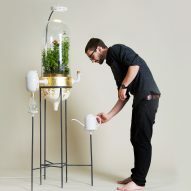 "One can pour dirty water collected from the kitchen or even the bathroom into the system and the plants help you filter it." The filtration system is a "considerably slow process"; however, Ghosh believes it can be upscaled, and could potentially cover the unused roof of an average UK house. This would allow it to filter 160 litres of water in 12 hours of daylight, and could also be linked directly to grey-water outlets or used to collect rainwater. Italian architect Stefano Boeri has also taken advantage of plants' purifying abilities, unveiling plans for a tree and plant-covered "vertical forest" city that could eat up China's smog. Ghosh did his undergraduate degree in animation and film at the National Institute of Design in India before moving to London to study at the RCA. A previous project of his, the Brinery fermentation tool, also looked at changing human consumption habits in the home. Ghosh's work was exhibited at the RCA's graduate show, which ran from 24 June to 2 July at the school's Kensington campus. 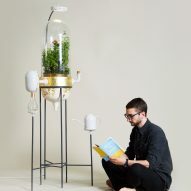 Another RCA graduate, Jen-Hsien Chiu, also worked with greenery, creating a device that motivated owners to exercise by feeding or starving a plant depending on their behaviour.